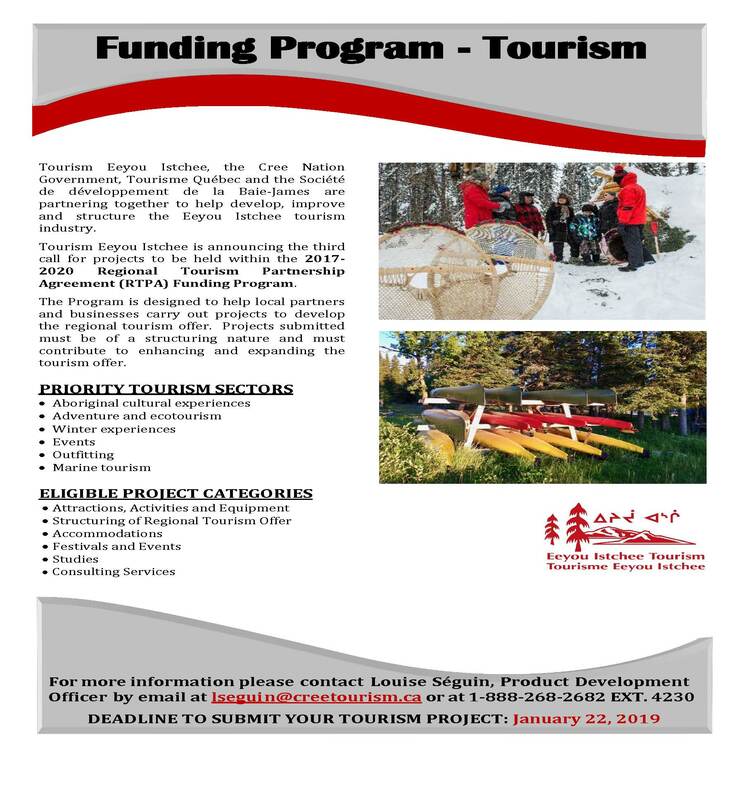 Eeyou Istchee Tourism is happy to announce a third call for projects in the 2017-2020 Regional Tourism Partnership Agreement (RTPA) Funding Program. THE DEADLINE to submit the funding requests has been postponed to February 28, 2019. The RTPA program is a 3-year program (2017-2020). Grants are available for promoters who wish to develop new products / services or expand their operations or infrastructures. – stimulate regional economies by creating employment, increasing the number of visitors and growing the tourism revenues. The financial assistance under the RTPA constitutes a grantand, as such, it is a non-refundable contribution. For each project, the beneficiary must invest a minimum of 10%of the total project cost. Promoters are encouraged to seek funding from other funding sources to complete the financing of their project. Be aware that RTPA funds are limited. All expenses incurred before the application is received by EIT are not considered eligible expenses and will not be reimbursed if grant is approved. See Promoter’s guide, p. 9, for details. Cree communities, businesses and entities.